Many choice moms (or SMCs as I use the terms interchangeably) tell their children the story of their conception early and often. I think this is a great idea--I just never did it. I think I was too sleep-deprived during their infancies and they were much, much more interested in colorful board books when they were toddlers. Oh, I made sure we read Todd Parr's The Family Book many times. We love all of Todd's books but that one has become a staple in our bedtime book rotation. Still I was never one to go into great detail about how and why we are a "Mommy and Boys" family. Early on, I made it clear that "we do not have a daddy in our family". I would say it matter of factly in the most neutral of tones. When Henry was a preschooler, I tried reading him some books about SMC families--he just wasn't interested enough to pay attention for any length of time. He much preferred Harry the Dirty Dog and Red Fish, Blue Fish. So I left well enough alone while always being vigilant for a sign that Henry wanted or needed to know more. Even four months into Kindergarten, he's yet to give me a clear sign. Of course, I wrote a letter to his teacher at the beginning of the year. It was short, sweet and to the point. I did not want to give too much personal information about Henry's conception but his teacher certainly had a need to know. She thanked me for the note and no issues have come up so far. I do wonder from day to day if Henry talks about his family with the other children in his class. He must though because one morning as we waited for the bell to ring a tiny little girl came up to me on the playground and said, "What happened to Henry's dad?" I was a bit stunned to be confronted by this question at 7:30 and didn't know quite how to phrase my answer. She's a little slip of a thing, not yet 5 years old and yet she had stopped me in my morning tracks. I was completely aware of Henry's eyes and ears trained on me as the two of them waited for an answer. "We don't have a dad in our family," I replied. "No, we just don't have a dad. But we have a brother, two dogs, a grandma and a grandpa." "Oh! You do?" she said with a relieved smile. Then she skipped ahead to the front of the line. This girl's questions did not bother me one bit. At that age, it's natural to be curious and concerned. No, it was the way Henry stared at me waiting for my response. Didn't he already know what I was going to say? We only have one story: the truth about our family. Yet Henry seemed not to know what I was going to tell this little girl. I knew then that it was time to go back to the books. Henry has changed quite a bit in the past 18 months. He has a much longer attention span. He can be very serious and analytical. He likes to wrestle with big questions. (He also likes to be incredibly silly and wrestle with his brother, but that's another post.) So this weekend I took Henry out for breakfast alone. I knew that his younger brother would not be able to focus on our talk and both Henry and I would be distracted by his presence. Two years from now I plan on having a similar conversation with Liam but for now this was about Henry and me. We went to Panera where Henry picked out the largest cookie with the most frosting. (I think he sensed that something was up and he was going to make the most of it.) Over creamy hot chocolate, we read three books. 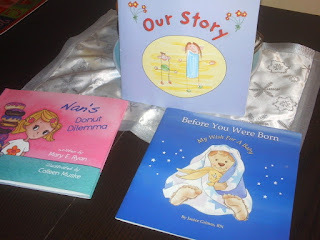 I have a few others, but Nan's Donut Dilemma, Our Story, and Before You Were Born: My Wish for a Baby seemed age appropriate at this time. Between each book, Henry would crawl on and off my lap. We'd hug and say "I love you". He paid attention to each story and the extra details I slipped in here and there. But he never asked questions. Not one. I told him that we could always read these books again--any time he wanted. As we walked back to the car, hand in hand, I wished I knew what he was really thinking. For now though, I choose to think that he's okay with our (true) story and when he's not, he'll let me know. I'm sure this won't be our last conversation on the topic; especially if I keep supplying the cookies. I am tearing up reading your post. You handled this beautifully. All great stories. We've been reading those three as well as a few others since Sam was a baby. We've also got a custom made "Sam's Story" that is filled with pictures from our lives and tells the story of how Sam came in to my life and we became a family. Sam will be 5 next month, and just this year as they have started talking about families in school he has been both fsscinated and excited about his family and how it came to be, how unique and special it is. Such a fun age. Thank you. What an awesome post. I plan to follow your lead. We already have that Todd Parr book and love it! Wow!! What a great idea and a great moment! i hope I handle it all as well as you do when Elsie gets there! Cory seems oblivious about his beginnings as well. I have occasionally mentioned it to him in passing and he has never really asked any questions or seemed interested. Honestly, nowadays there are so many different types of families in kids classrooms that nothing seems different. I've been lurking on your blog for quite awhile but thought I would de-lurk to say how lovely this story is. I love how he crawled into your lap between books! I have been lurking on your blog for awhile but thought I should de-lurk to say what a lovely post. I love how he climbed onto your lap between stories! I too have built an arsenal of SMC books for Elena but am yet to tell her her conception story but am always mindful about being open & honest. I like that you sent a note to his teacher. That is something I've always intended on doing. Thanks for this post and the books. It's always a question of how and when to talk to your kid about this. I think you handled it well!